White Gold Rhodium Bonded Crown Style Eternity Ring Featuring Milligrain Accents and Bezel, Channel and Pave Set Round Cut Clear CZ in Silvertone - Click on photo to enlarge. 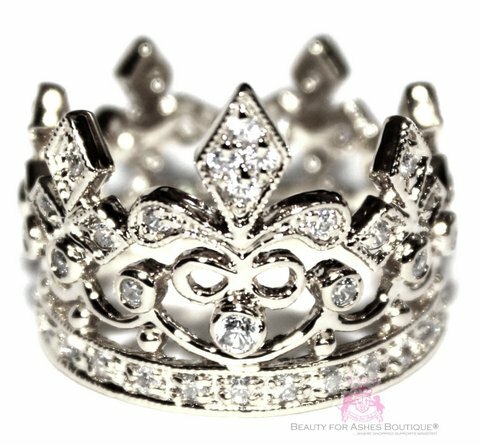 Show everyone you're the Queen with the Queen's Royalty Ring. It features an ensemble of small round cut channel set CZ, bezel set CZ, and pave set CZ that resemble the Fleur De Lis in a journey style. White Gold Rhodium Bond is achieved using an electroplating process that coats the item with heavy layers of rhodium, a close cousin of platinum that costs three times as much, which gives our jewelry a platinum luster.